The female who entered the bank was described as being approximately 5’ 2” – 5’ 5” tall and is believed to be between 25-35 years old. 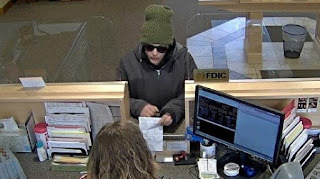 On 4/11/18 at approximately 10:48 AM the Vermont State Police was dispatched to a bank robbery at Union Bank on Rt. 15 in Jeffersonville. A female entered the bank and handed the teller a note demanding money. No weapon was displayed. The female fled the bank on foot with an undisclosed amount of money. The female was seen getting into a white colored car near the bank. The white colored car was described as having a large rust spot on the rear passenger side quarter panel. The car was driven by another female. The female who entered the bank was described as being approximately 5’ 2” – 5’ 5” tall and is believed to be between 25-35 years old. The female was wearing a gray sweatshirt/jacket, a green knit hat and sunglasses. No one was injured in the robbery. Anyone with information is asked to call State Police Detectives at the Williston Barracks.